Ponche de Leona was three weeks overdue. The 9-year-old mare kept showing signs she was about to foal, and her owner Carole Rio, who leases 40 acres of Rose Grove Farm near Ocala with her husband John, had been staying up day and night with her. Whenever she was unable to, John would take over. They eventually decided to put her out in the field to make her more comfortable. It was Father’s Day, June 15, extremely late for a mare to give birth. But when the Rios purchased the daughter of Ponche at the 2007 Keeneland November mixed sale for $33,000 from Adena Springs, in foal to Macho Uno, they knew she was a June cover and would foal late, but were expecting her to give birth in May. At 3:30 in the afternoon as they drove back to the farm, Carole received a call from Sekay saying the mare was foaling. “Oh, damn,” exclaimed Carole, who said she doesn’t like foaling mares out in the field. “When we arrived, Jeff and his wife were there and they’re standing over the foal and praying. I was doing my own praying on the way there. When I arrived I looked at him and he was lifeless, and I couldn’t see any breathing. I started rubbing him and finally I just stopped and we all prayed together. Just then this sucker jumped up and started running. He didn’t just stand up he jumped up and then ran off from the mare. It was bizarre. They find out alright. The foal, believed to be dead at birth, was eventually named Mucho Macho Man and is now one of the leading contenders for the Kentucky Derby Presented by Yum! Brands (gr. I). “After he ran off in the field, Jeff’s wife said, ‘We ought to call him Lazarus.’ And that was his name on the farm,” Carole said. The Rios’ foaling adventures with Ponche de Leona did not end with Mucho Macho Man. “What’s weird is that this mare had a Chestertown Slew foal this year, and this time we had her in a stall,” Carole said. “I’ve foaled out thousands of mares, working at Due Process Farm and so many breeding farms since I was a kid, but I’ve never seen anything like this mare and her foals. This foal goes to get up and jumps up on her feet and stayed up for almost two full hours before lying back down. I don’t know what’s going on with this mare. These were the first two foals I had out of her. This foal naturally couldn’t run off because she was in a foaling stall, but I have no doubt she would have done it had she been out in the field. Perhaps she passed that high pain tolerance on to Mucho Macho Man, who ran every step of the way in the Louisiana Derby with only three shoes and came out of the race a bit foot sore. Not only did the Rios breed and foal Mucho Macho Man, they broke him and gave him his early training. “I’m kind of humbled by the whole experience,” Carole said. “He was the easiest foal to be around. We had him out with Special Kid, who placed in the Borderland Derby for Doug O’Neill; that’s who he was weaned with. They were the only two foals we had that year. When Mucho Macho Man was running around the paddock it was like he was cutting daisies. “While we were training him on the farm you couldn’t go far enough with him. He never got tired. And he kept his fitness himself. He’s rangy and lanky and has always been that way. A lot of horses don’t keep their fitness and you have to get them fit. He maintained himself. This horse has always been easy on himself and real smart. Mucho Macho Man was so big and gangly they didn’t want to push him, so they gave him only one easy work at the training center. They then shipped him to trainer Bill White and he ran six weeks later, finishing second. One person who had followed Mucho Macho Man when he was a young horse on the farm was Jim Culver of Dream Team Racing. He watched him develop and grow and said he had a funny feeling he was going to be something special. Just prior to the colt turning 2, Culver purchased him from the Rios, who retained a share. Ironically, the Rios wound up consigning Ponche de Leona to the 2009 Ocala Breeders Sales Company October mixed sale, a move Carole was against. If she was against selling her before the sale, she certainly was even more so when the mare brought only $5,000. “I contacted Kathy about buying her back before he started, but she was unsure about it. The owner she purchased her for wound up embezzling money and Kathy had to sell out to try to get her board money back. So I wound up buying ‘Ponchie’ back, and she was already in foal to Chestertown Slew. I would have regretted it for sure had I not gotten her back. So, it’s really weird how it all worked out and having the mare back with me. The whole story is freaky. It got even freakier when Mucho Macho Man was entered in his career debut on July 10 at Calder, but had to be scratched when the horse in the stall next to him flipped in the gate, and he got nicked up enough to be scratched by the vet. When he was entered back again seven days later he finished a good second to a highly promising colt named Gourmet Dinner. After the race, Dean and Patti Reeves were looking to buy a young horse and were touted on Gourmet Dinner, but when Dean watched the tape of the race he liked Mucho Macho Man more than Gourmet Dinner and purchased majority interest in him instead from Dream Team Racing. Just as Ponche de Leona is meant to be where she is. “If it ended now it still would be a wonderful ride,” Carole said. 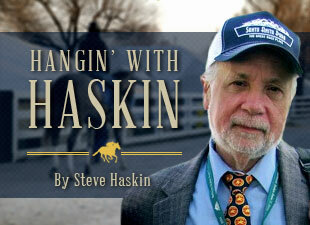 “I had only two foals on the ground that year and they’re both stakes horses. One of 35,000 foals a year get to start in the Derby and what’s the likelihood of me having one of them?